A sailor, bound on a long voyage, took along with him a Monkey to amuse him while on shipboard. As he sailed off the coast of Greece, a violent storm arose in which the ship was wrecked and he, along with his Monkey and all the crew were thus forced to swim for their lives. 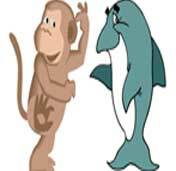 A Dolphin saw the Monkey fighting with the waves, and thinking him to be a man (whom he is always said to befriend), came and placed himself under him, to convey him on his back safely to the shore. When the Dolphin arrived with his burden in sight of land not far from Athens, he asked the Monkey if he were an Athenian. The latter replied that he was, and that he had a very noble origin. The Dolphin then inquired if he knew the Piraeus-the famous harbor of Athens. Supposing that a man was meant, the Monkey answered boastfully that he knew him very well and that he was his close friend. The Dolphin, indignant at these false words, dipped the Monkey under the water and drowned him in the deep blue sea. Those who pretend to be what they are not, sooner or later, find themselves in "deep" trouble.